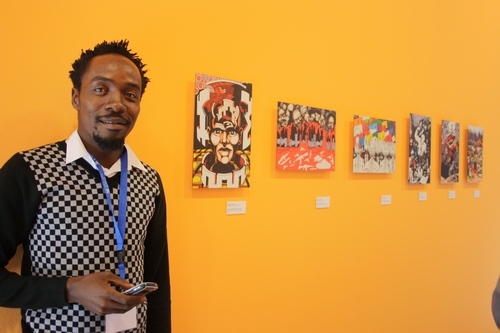 Political cartoonist and graphic novelist Ramón Esono Ebalé, who was arrested September 16 in his native country of Equatorial Guinea, remains detained without charge long past the time allowed by law. Although he has been questioned about his work critical of the country’s dictator Teodoro Obiang Nguema Mbasogo, it seems authorities now may intend to charge him with money laundering in order to avoid the perception that they are curtailing free expression. Ebalé now lives in El Salvador, but had made a brief return to Equatorial Guinea in order to renew his passport. According to Human Rights Watch, he was arrested along with two Spanish nationals while leaving a restaurant in the capital city of Malabo on September 16. The Spaniards were released after questioning over their connection to Ebalé, but the cartoonist himself has not yet been taken before a judge (required under Equatoguinean law within 24 hours) or charged with a crime (required within 72 hours). Ebalé works under the Spanish pen name Jamón y Queso (Ham and Cheese), creating standalone political cartoons and a Kickstarter-funded online graphic novel called La Pesadilla de Obi (Obi’s Nightmare). The satire that imagines what Obiang’s life would be like if he suddenly became a regular Equatoguinean citizen was also printed and distributed within the country. In an interview with Public Radio International, journalist Rowan Moore Gerety noted that Obiang likely wants to extract a humiliating public apology from Ebalé, as he has done to opposition politicians in the past. Various international advocacy groups are pressuring Equatorial Guinea’s government to release Ebalé. The Association of Professional Illustrators in Madrid today organized a protest outside the Equatoguinean Embassy there, and the organization EG Justice has launched an online petition with nearly 6000 signatures thus far. The Voice Project offers a form letter that can be personalized and sent to Equatorial Guinea’s ambassador in the U.S.